It’s summer and even though my work schedule slows down almost to match the pace of those beloved lazy summer nights, I’m still too busy to whip up a culinary work of art during the week. My healthy taco salad bowls are the answer to a quick and tasty (and might I add EASY) dinner that is full of flavor. It also goes wonderfully with a margarita. I realize that this recipe can barely be considered to be a recipe, but sometimes I need the jolt of a new meal idea, so I hope you like this enough to add it to your dinner rotation. Preheat oven to 350 degrees, according to taco shell bowl directions. Dice tomatoes and set aside. In a large frying pan using 1/4 cup water in the bottom of the pan, heat diced chicken until just cooked. Add diced scallions and toss with chicken. Add taco seasoning, according to packet directions. Cook off water until the chicken is coated with the seasoning. Put two taco shell bowls on a baking sheet and heat in oven for five minutes or until edges are brown. Place each taco shell bowl on a plate. 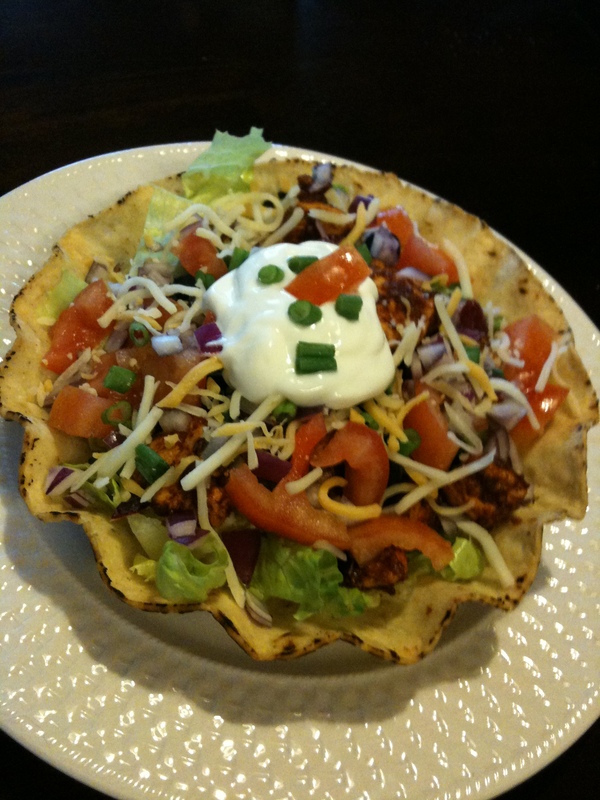 Fill each taco shell bowl about a third of the way up with chopped romaine lettuce. Add chicken on top, followed by cheese, tomatoes, red onion and jalapeno peppers if desired. Add a dollop of sour cream and guacamole on top or on the side of the plate. Garnish with a few pieces of diced scallion onion and diced tomato. This entry was posted in Chicken, Dinner, Healthy, Mexican, Uncategorized and tagged Chicken, Dinner, Food, Healthy, Mexican, Recipes. Bookmark the permalink.